AC Stairs specialise in manufacturing and installing bespoke stairs and staircases across Northern Ireland. 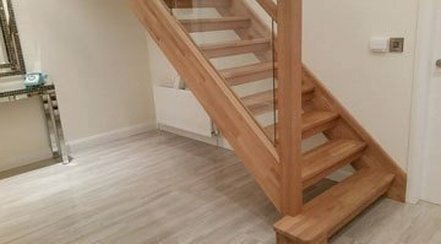 From wooden stairs, plywood stairs and glass panels staircases, we do it all. You can benefit from a full design service for your staircase, meaning if there's something specific you want, we can do it for you. You can even visit our workshop to see how your project is taking shape. There's no reason your staircase shouldn't be the very centre of your home. With our glass panel staircases, you can add a real centrepiece to your interior. We offer plain glass panelling, but also more ornate etched glass for different tastes. AC Stairs provide a fully customised WBP Plywood supply service. We can supply WBP Plywood to exact specifications including shape, size and thickness. Our flexibility means that you can either collect your Plywood or we'll deliver it for you. Based in Limavady, we serve the whole of Ulster, including Belfast, Londonderry/Derry, Armagh, Antrim, Ballymena, Dungannon, Cookstown, Coleraine, Ballymoney, Ballycastle, Lisburn, Hillsborough, Newtownards, Bangor, etc.